These 15 in. and 18.1 in. flat panel displays now come in your choice of black or beige and as desktop models or wall mountable to suit the aesthetic and ergonomic demands of your workspace. iMac? No. 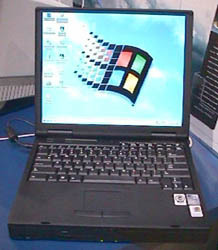 This a Windows machine! epower, from Future Power. 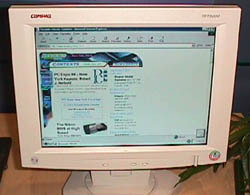 The epower contains a floppy drive, 40X CD-ROM drive, mouse port, Celeron 433 processor, 64 Mb RAM, 6.4 gig hard drive, a 10/100 base T Ethernet port and a 56K modem. 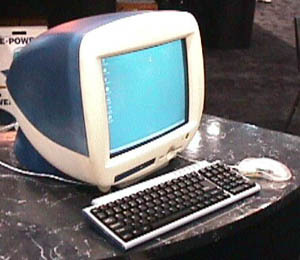 It retails for $799 and it was demonstrated for the first time at PC Expo 99. 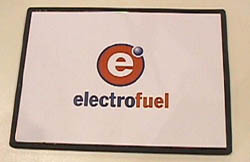 Future Power is a joint venture company with Daewoo Telecom and Daewoo was involved in design of this product. Finally a manufacturer has a device that attaches inside your PC and has REAL buttons and knobs that let your control your audio system like a real stereo system! Future Power's NEWQ Gold fits in a 5.25" drive bay (about the size of a CD-ROM drive) and provides a stereo amplifier, a 7 band digital graphic equalizer, digital signal processing effects, SRS surround sound and provides real time equalization with volume control. I saw a cool amplifier like this (internal to the PC with lights and knobs) at Comdex 1994 and haven't seen anything like it since. 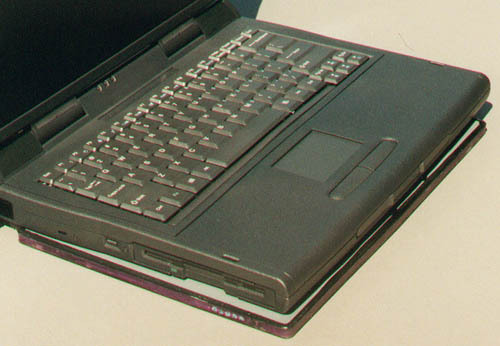 Calluna Technology announced that the world's first Type II 260 megabyte PCMCIA hard drive will be shipping by Friday, June 25th, 1999 which is 3 days before the Iomega clik! starts shipping. Since the drive is only 5 mm thick it is half the size of "conventional" Type III hard drives which Calluna also manufactures in sizes as large as a GIGABYTE! This tiny hard drive (slightly larger than a credit card) will retail for $299. This compact and light weight display headset is intended to be used for commercial applications such as virtual amusement parks, driving simulators, virtual sports training, 3D graphics and design, virtual showrooms and museums along with DVD movies. It uses new Microdisplay technology 1.44 million dots of resolution which simulates a 55 inch screen as viewed at 6 feet (2 m). 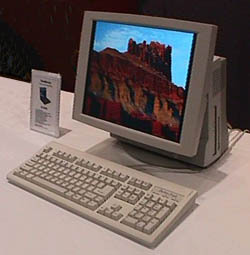 The DYHMD-B2000 accepts SVGA, VGA, NTSC, PAL and SVHS inputs and can be used as a computer display at 640x480 and 800x600 resolutions. Etak, makers of SkyMap, a product that I have used in excess of 12,000 miles (I used it back and forth to this PC Expo 99), now has a product that goes beyond mapping and helps you avoid congestion by letting you know traffic problems before you are part of the congestion. This personalized, real-time service is provided from information from Metro Networks, the world's largest supplier of traffic information. By simply tapping on a Palm VII wireless organizer, you can receive information on construction delays, accidents, road closures and general congestion. I could have used this on the trip, so I could have used the Holland tunnel instead of the congested Lincoln tunnel when I went to the Digital Focus event. On the way home we encountered traffic (single lane) during construction along I-80. Although we got off and used the Etak GPS (and physical paper maps to get a rough idea if a reroute was possible) to find a way around the traffic problem. Traffic Touch would have allowed us to get off at the previous exit instead of having to go for three miles in the traffic before we could get off. The Traffic Touch Service will initially be available for New York and Washington areas and will expand to 21 more metropolitan areas, but I saw the Bay area (San Francisco) traffic and Chicago traffic while I was standing at the Etak station, in the 3Com booth. Chicago had 41 traffic problems. Amazing. I was in New York and had more information about the Chicago traffic problems than most of the drivers actually driving in Chicago that day. All I can hope is that this service will be expanded for interstate routes for use by trucking companies and others trying to avoid the metropolitan areas. 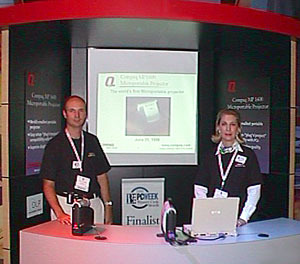 Chris and Kimberly demonstrated Compaq's new MP6100 microportable projector for us at the Compaq booth at PC Expo 99. This picture was digitally stitched with Enroute Imaging's Quickstitch and is an example of how well it works since the lighting in this area of the Compaq booth was changing from red to green to blue every few moments. Each half of this picture was taken while a different color spotlight was on and it was successfully stitched. 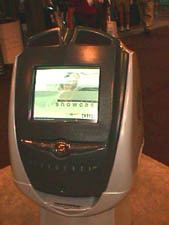 The picture was contrast adjusted and the visible seams in the display booth were eliminated through digital retouching using Adobe's PhotoDeluxe: Business Edition. See our Review of QuickStitch. This new, flat touchscreen monitor offers a 15" (38.1 cm) viewable 1024x768 surface that can be controlled with your finger or pen. This monitor can be used at lower resolutions and has automatic sync. The "touch" circuitry is designed by Microtouch and is applied to the flat screen during the manufacturing process resulting in a more stable touchscreen and a single source for warranty and technical support. This monitor has a three year warranty from Compaq and is priced at $1,799. 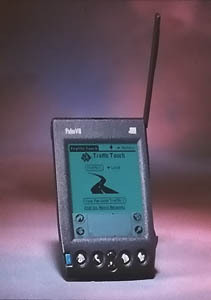 Although all touchscreens can move the cursor and most can also react to "clicks", the TFT5000 can create right clicks! This recently released product runs on a Exchange or Notes email servers and scans 100% of the inbound and outbound email for viruses. It is not MAPI reliant and is fast ( Sybari tells Reviews OnLine that it is five to ten times faster than the competition). A two year license ranges from $40 per user for a 1 to 250 user license to $12 per user for a 10,000 user license. This electronic "switchbox" helps you quickly switch between two or four computers, depending on model purchased. It switches the video, mouse and keyboard ports. The Switchman and the computers can be cabled together with regular cabling or Raritan also sells bonded cables that make the installation look less cluttered. The two computer version retails for $169 and the four user version is $249. 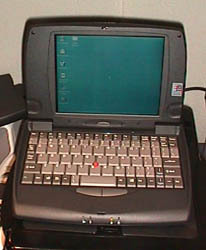 While the computers can have either PS/2 or serial port mouse ports, the actual pointing device must be a PS/2 device. Visioneer demonstrated many of their scanners at PC Expo 99, including the recently announced Strobe Pro, a compact, 1.3 pound sheet fed color scanner, perfect for mobile users. 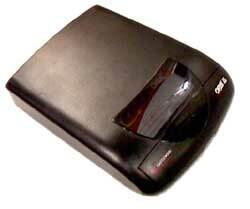 This small (2" x 2.5" x 11") scanner can connect to a Windows PC via a USB, serial or parallel port or to a Macintosh computer via a SCSI port or USB port (separate models). Strobe Pro features a 30-bit color, 300x600 dpi optical resolution and 2400 dpi enhanced resolution. The Windows version retails for $199.99 and the Macintosh, iMac and NT 4.0 versions retail for $249.99. This unit has a mobile Pentium II 333 MHz processor, 64 MB of RAM, a 2.5" 6.4 GB hard drive, 56K modem, 14" active matrix 1024x768 screen, 2X AGP 8 MB ATI Rage video, Touchpad, IrDA port, serial port, parallel port, video out port, USB port, 2 PCMCIA type II slots. The unit weighs 9.5 pounds and is intended as a desktop replacement that can be easily moved around or taken home and not for the road warrior constantly traveling. Also included is an internal Floppy / CD-ROM drive module that can be replaced with a second Lithium Ion battery or an optional Floppy / DVD drive module with internal decoder. This unit is Y2K compliant, cooled by heat pipe and retails for $2,199 (CD-ROM version). Although this model is not a lightweight laptop, it provides a great alternative to conventional desktops and tower units. It allows the unit to be easily moved in the office, taken home or locked up at night for added security. This 2.2 GB external device retails for $199.95 and includes one media. 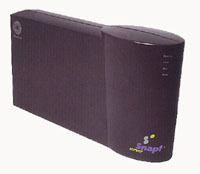 The device has a 12.2 megabits per second transfer rate and the Macintosh version is shipping this week (late June 1999). The PC version will be shipping in early July. Seems like only yesterday (actually mid 1996) that I was very excited about my $199 Syquest EZ-135 drives that stored 135 megabytes of data on $20 cartridges. This drive looks to be an excellent replacement. No this isn't a picture of a new mousepad, it's a battery. The new PowerPad extended life battery is intended for laptop users to go for 15 hours without having to recharge. This means that long overseas flights can be flown with your computer running, presentations can be made without a power outlet, weekends at the cottage or on the boat or even Reviews OnLine editors using their pen computers during a long day at a trade show. (Well, why not?) What is also unique to this Lithium Ion SuperPolymer battery is that the battery can be molded into almost any form to "fit the shape of any device it will power". So batteries as thin as a credit card or the size of a briefcase can be build with this superpolymer. The PowerPad 160 has the highest energy density of any battery in the world and produces 160 Watt hours with a run time of about 15 hours. It retails for $499. PowerPad models with 50, 100 and 200 watt hours of capacity will be available soon. This product can plug into Excel and PowerPoint 97/2000 and create more compelling charts and graphs. It seems that there has always been a need for a product like this, since graphics quality has always been lacking in Excel. (As far back as 1996, Software Publishing created Harvard ChartXL 2.0 to create the better graphics everyone wanted out of a spreadsheet -- see review). What makes this product more helpful is that these plug-ins integrate into the package so you can add voice tracks, transitions, eye catching charts, soft shadows and other effects. Plainly stated, Office Advantage can help your PowerPoint presentations and Excel charts look more professional. 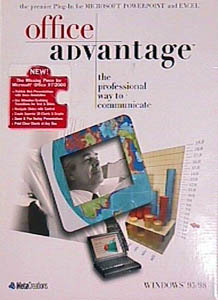 Office Advantage runs on Windows 95/98/2000/NT4, Excel 97/2000, PowerPoint 97/2000 on a Pentium 120 or faster with 32 MB RAM and costs $99. Hewlett Packard introduced their latest eight-way Intel-based server which brings the performance associated with a UNIX based system to the world of Windows NT. The NetServer LXr can scale up to eight Intel Pentium III Xeon 550 MHz processors, 32 GIGABYTES of RAM with four 64 bit PCI controllers -- all in a single 7U rack! The 8500 LXr is fully hot swappable/hot pluggable and features 90 system monitoring and reporting sensors, fault-resilient booting and advanced memory scrubbing software. Optionally, using the HP SureStore DAT24i accessory, the 8500 LXr has the world's first hardware based, one-button disaster-recovery tape backup solution. It will be available in late Summer 1999 and ranges in price from $23,600 to $26,300. In their commitment to investment protection, Hewlett Packard will offer an in-box upgrade from the NetServer LXr 8000 system to the NetServer LXr 8500 system. They are the only major vendor to offer an upgrade from a rack-optimized four-way server. This $99 option for Hewlett Packard Omnibook notebook PCs is a second generation smart card reader that adds a BIOS lock and a faster encryption engine to the system. 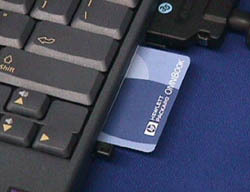 The BIOS lock secures the computer by checking for the user's authorized smart card BEFORE the system is booted. This is important, because if the system is booted on a floppy or other device, unauthorized parties can more easily bypass software-only data protection. This Smart Card kit also includes a screen saver and an undock/resume function that uses the Smart Card instead of a password. The smart card works like a physical key to "unlock" the system without requiring passwords that can be forgotten or guessed by intruders. Security conscious buyers may be attracted to the Hewlett Packard line of Omnibook laptops for this feature alone. 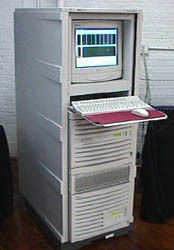 This 450 MHz Pentium 3 computer features 64 Mb of DRAM, a 10 GB hard drive, 15" (38.1 cm) L.C. display, 24X CD-ROM drive, 1 PCI slot, 2 Card Bus (PCMCIA) slots, 2 USB ports, FIR (fast Infra-Red), 4 MB video (ATI Rage LT Pro; AGP / 24 bit XGA) video, 10/100 Ethernet jack, 56K Modem, sound, serial and parallel port. This all-in-one unit weighs 16 pounds, costs $2,995, consumes only 91 watts of power and has a four year warranty. This notebook seems to be nearly identical to the prototype Mag Innovision "Tiny Note" I used on my trip back from Comdex Fall 1998. That unit worked quite well running Etak SkyMap GPS. It was so small and fast. Everyone I showed it to loved it! This unit features a Cyrix Gxm 200 MHz processor, an 8.2" DSTN LCD, up to 128 Mb of RAM, 1 MB video RAM, one PCMCIA type II slot, optional CD-ROM drive, external 1.44 Mb floppy, removable 2.5" 12.5 mm hard disk drive module, 85 key (including Windows 95 keys) keyboard with nearly full size (19mm pitch), internal microphone and stereo speakers, IrDA port (supports SIR). 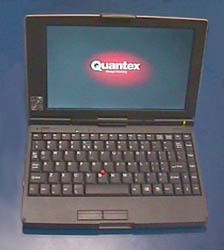 This units weighs 3.9 pounds and is 10.87" x 7.05" x 1.42". Retail price is $1,100. 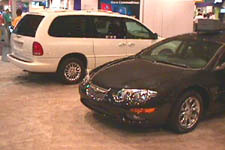 Chrysler again (first time was Spring Comdex 1999 in Chicago) had two of their 1999 models on display at a major computer event. There were several more vehicles at other exhibitor's booths at PC Expo -- see Reviews OnLine Auto for automotive coverage of PC Expo. This kiosk allowed users to select the car they were interested in, get information, specs and even see the car in action! Kiosks like this one are at each event that has Chrysler cars, even the Ten Best Tour . This unique flat display monitor allows excellent privacy when working on sensitive documents such as payroll, business plans or human resources records. To an observer, the screen looks like a completely white screen without any useful information. 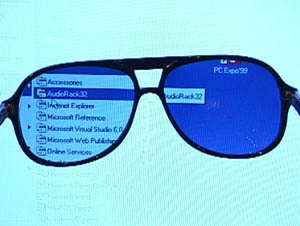 When the glasses are put on, the Sceptre BT15+ screen becomes readable, like any conventional display. 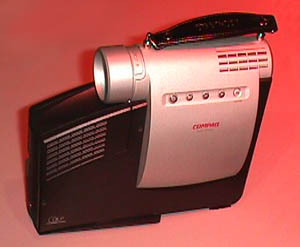 This model uses active matrix technology, has a 1024x768 resolution with analog interface and retails for $1,499. Sceptre also makes a notebook computer using this same technology. This tiny file server can be installed in less than five minutes and supports Windows 9X, NT, Novell, LINUX, UNIX and Macintosh computers. It runs on IP, IPX, NetBeui and Appletalk network protocols which allows simultaneous cross-platform exchange of files between different systems. No longer will you have to perform file transfer between Windows PCs, Macintoshes and SGI workstations. The software is in flash memory so upgrades are easy (and free). The unit has a 3 year warranty and a 30 day money back guarantee. The 8 GB model is $995 and the 32 GB model is $2,495. This product is so unique that Quantum (hard drive manufacturer) bought the company! This Teac drive boasts a 4x write speed in both CD-R and CD-RW modes, along with a 32x read speed. 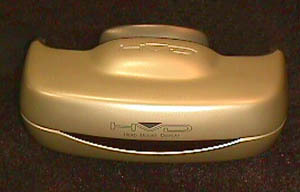 This CD-RW drive will be available in September 1999. Price has not been determined. This unusual 300 MHz MMX Celeron based laptop has a 1024x600 (yes, that's NOT a misprint - 1024x600) screen with a video out of 1024x768. Unit retails for $1,299.